Titanium Powder Metallurgy contains the most comprehensive and authoritative information for, and understanding of, all key issues of titanium powder metallurgy (Ti PM). It summarizes the past, reviews the present and discusses the future of the science and technology of Ti PM while providing the world titanium community with a unique and comprehensive book covering all important aspects of titanium powder metallurgy, including powder production, powder processing, green shape formation, consolidation, property evaluation, current industrial applications and future developments. 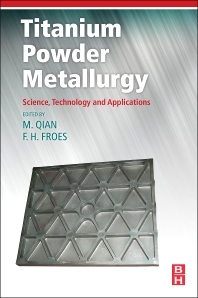 It documents the fundamental understanding and technological developments achieved since 1937 and demonstrates why powder metallurgy now offers a cost-effective approach to the near net or net shape fabrication of titanium, titanium alloys and titanium metal matrix composites for a wide variety of industrial applications. Each chapter is delivered by the most knowledgeable expert on the topic, half from industry and half from academia, including several pioneers in the field, representing our current knowledge base of Ti PM. Includes a critical review of the current key fundamental and technical issues of Ti PM. Dr. Qian’s research activities have been largely focused on physical metallurgy of light alloys (Ti, Mg and Al). Since 2008 he has been leading a research team comprised of researchers from four Australian universities to focus on the development of Low Cost Powder Metallurgy Titanium Alloys, supported by the Australian Research Council through the Centre of Excellence for Design in Light Metals. He initiated the first international conference on Powder Processing, Consolidation and Metallurgy of Titanium (4-7 Dec 2011, Brisbane, Australia), co-sponsored by Materials Australia, Titanium Industrial Development Association (TiDA) New Zealand, Japan Society of Powder and Powder Metallurgy (JSPM), The Mineral, Metals & Materials Society (TMS), and Chinese Society for Metals (CSM). As the lead organiser, he organised the TMS symposium of “Novel Synthesis and Consolidation of Powder Materials” at the 142nd TMS Annual Meeting & Exhibition (3-7 March 2013 San Antonio, USA). He is currently on the editorial/review boards of Metallurgical and Materials Transactions A, Powder Metallurgy, and International Journal of Powder Metallurgy (liaison committee). He is also a board member of the Asian Powder Metallurgy Association (APMA).